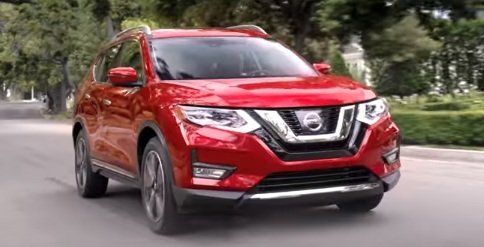 Nissan showcases the 2017 Nissan Rogue in a new commercial, highlighting that, with its available Nissan Intelligent Mobility technologies, this SUV helps look out for you and your entire family. The 30-second spot, titled “New Tricks”, begins with a father and his little daughter playing Frisbee in the front yard with their dog, a dachshund. When the latter doesn’t want to play anymore, the dad decides to get out of their routine and flings the Frisbee toward the city. The entire family, pet included, gets in the car, a red 2017 Nissan Rogue, and follows the Frisbee, which stops at a stadium. Actually, it’s the little dog catching it after climbing over the top of the SUV and using the lift gate to launch himself up in the air. The spot ends with the voiceover presenting the 2017 Nissan Rogue and the Brand New Nissan Rogue Sport and saying the tagline “Take on today”.